click here Our welcome banner was vandalized this past December at Ascension Lutheran Church. It was slashed in two pieces. It stated, “Immigrants and Refugees Welcome” and displayed a picture of Mary, Joseph and Jesus in route to Egypt. cheap generic viagra This picture highlights the fact that the Holy Family were refugees, as Matthew’s gospel states that they fled to Egypt after learning that King Herod sought to destroy the young child because he viewed Jesus as a threat to his power (Matthew 2: 13-18). Because of more stringent screening processes and refugee bans, there are fewer refugees admitted into the United States than has been allowed in the past. The Department of Homeland Security has called for a cap allowing only 45,000 refugees to resettle in the United States in fiscal year 2018. (This is only a small fraction of the estimated 16 million refugees worldwide). This is the lowest cap in decades, and even now the slow admission process is already on pace to fall well below the 45,000 mark. Even those who are already here, and have lived in the United States for years, face the real fear of deportation. Refugees from countries such as the Nicaragua, Sudan and Haiti (including a large Haitian population here in San Diego) have lost what is called “Temporary Protected Status” — a special legal status granted to those who have fled countries because of natural disaster, war or violence. Losing this legal protection means that individuals are in danger of being torn from their families, and sent back to countries broken by violence or natural disaster. San Diego’s proximity to the border is another hardship for immigrants and refugees. San Diego falls within what is called the “border search exception,” an area that reaches 100 miles from the border into the United States where certain federal officers are allowed to conduct search and seizure operations without a warrant or probable cause. In addition, individuals are reported to ICE even by neighbors or family members, and students from the deferred action on childhood arrivals (DACA) program have had family members deported. How should we respond as a community? How should people of faith respond? A good place to start is by studying what the Bible has to say concerning God’s will for refugees, immigrants, and the most vulnerable people among us. In Exodus, God specifically commands the people to care for the alien, reminding them that they themselves were once migrants and aliens, “You shall not wrong or oppress a resident alien, for you were aliens in the land of Egypt” (Exodus 22: 21). Again, in Deuteronomy, we see God’s concern for foreigners, “God defends the cause of the fatherless and the widow, and loves the foreigner residing among you, giving them food and clothing. And you are to love those who are foreigners, for you yourselves were foreigners in Egypt.” (Deuteronomy 10: 18-19). In Psalm 146, we see God’s almost obsessive concern for the most vulnerable, that God loves and protects them personally, “The Lord watches over the foreigner and sustains the fatherless and the widow, but he frustrates the ways of the wicked” (146:9). Those are just a few of many passages. In fact, there are so many references to God’s love and care for the alien or foreigner in the Bible, that it is almost overwhelming. Take time to study the issues facing immigrants and refugees. Explore the ways in which fear, apathy, and bias contribute to the systematic abuse and harassment of them, a system which is bigger and more complex than any one person. I highly recommend reading “City of Thorns: Nine Lives in the World’s Largest Refugee Camp” by Ben Rawlence and “The Lost Boys of Sudan: An American Story of Refugee Experience” by Mark Bixler as starting points for a better understanding of the experience of refugees. Find ways to reach out to immigrant or refugee communities — not to fix problems or rescue people, but simply to listen to their stories with humility and respect. Find ways of fostering relationships with them based on mutuality and equality. My life has been greatly enriched and deepened through developing such relationships, and yours will be too. Get connected with organizations that advocate for the human rights of immigrants and refugees. 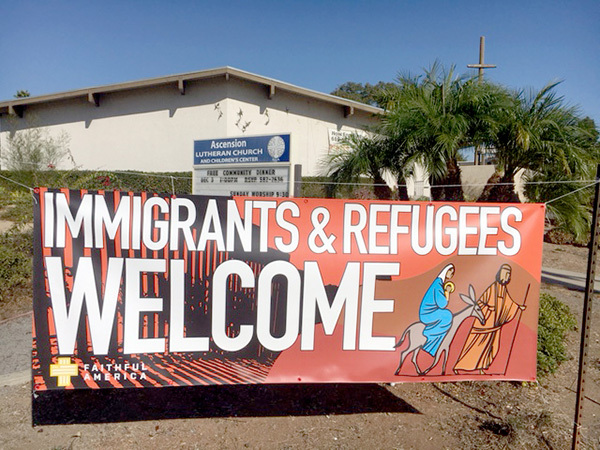 For example, there are many organizations doing great work to advocate and welcome them in San Diego: Jewish Family Services, International Rescue Committee, Survivors of Torture International, Catholic Charities, and others are very active in advocating for immigrants and refugees. We are grateful for their efforts. To my fellow Christians: This is the time for us to stand up and be the church. There are a lot of people who are turned off by the church. They love Jesus, but not the church. They see us as clinging to the status quo, of being a club more concerned with our own safety and comfort than in bandaging the wounds of the poor, or being a true companion to the sick, hungry, incarcerated, and undocumented. They are watching us more closely than you think. They are watching us to see if the church will stand up and be the church in such dire times as these. Let’s show them we can be the church for the poor and most vulnerable together. 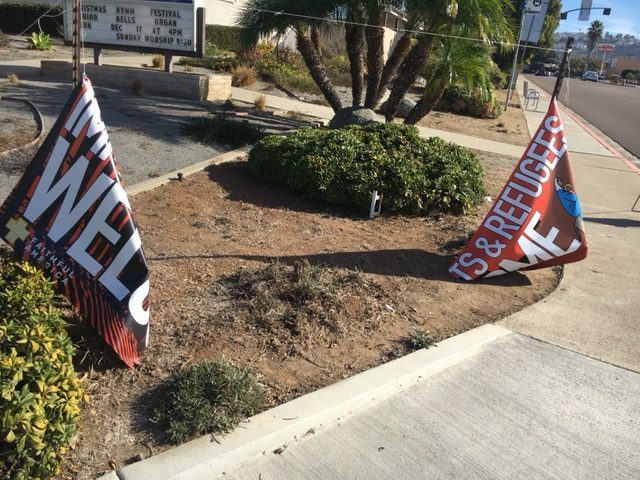 To the person(s) who vandalized our banner: We are angered and deeply saddened — not because you vandalized church property, but for any fear and distress you may have caused those who already feel unwelcome, invisible or unwanted; for trying to prevent our church from communicating, however falteringly, a message of welcome to them. Yet, Christ commands us to “love our enemies” (Matthew 5:44). So by his command, we love you, praying that you become the person God has created you to be. We welcome you to join us at Ascension in the journey of self-inventory and spiritual growth, to examine and renounce our privilege gained at the expense of the most vulnerable, to turn away from the apathy, fear, and ill-will which intentionally or unintentionally harm so many immigrants and refugees in our communities, and to turn towards them with contrite hearts, open arms, and a spirit of friendship. It is only through deep soul-searching, honesty, and God’s grace that we can find the path of healing and reconciliation, not just with our friends, family and acquaintances, but especially with our vulnerable neighbors in need. — Rick Fry is the pastor at Ascension Lutheran Church in Allied Gardens.